This charger is no longer available, it is replaced by the PulseTec Excel 100, click here. 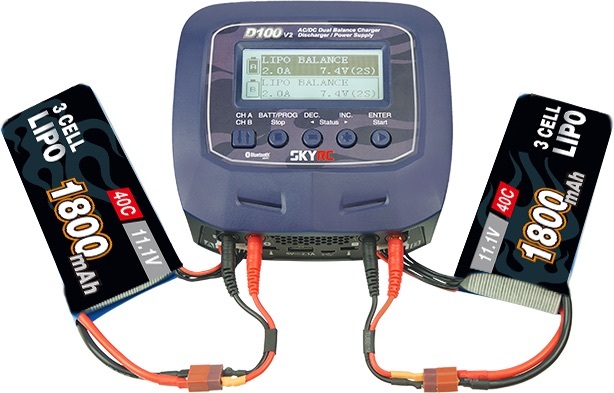 SkyRC D100 v2 is a twin-channel charger with two independent circuits which can charge batteries of varying chemistries (LiPo/LiHV/LiFe/Lilon/NiMH/NiCd/PB)simultaneously. Capable of operating as a power supply with the maximum output of 100W helps the hobbyists to power the DC equiments. With its unprecedented function of voice guide, even a freshman can use this charger without any hurdles. Additional feature including our "SCAN TO GO" either. Purposes to make the charger more user-friendly and customizable. 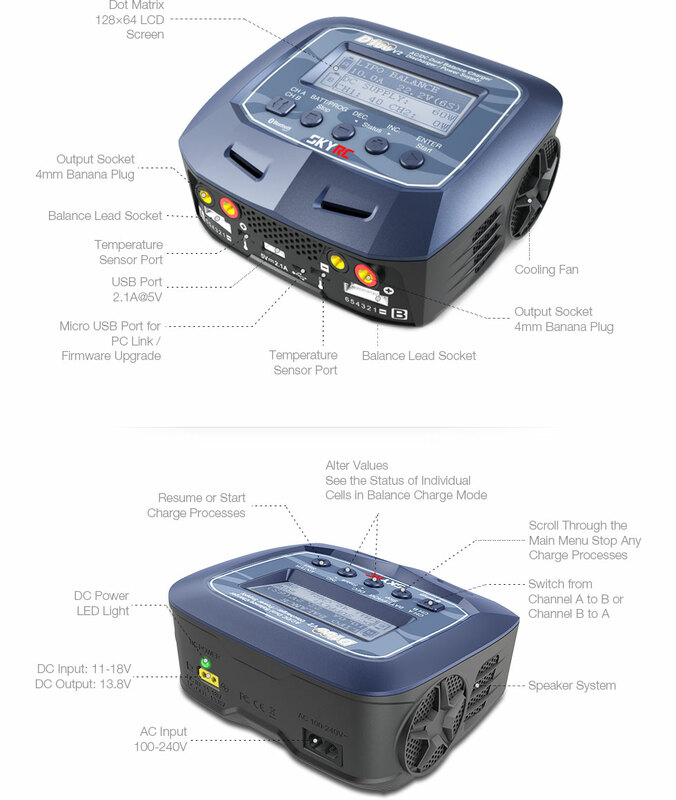 A speaker supported English and Chinese separately have been included in the left side of the charger that can reduce the times for misoperation. 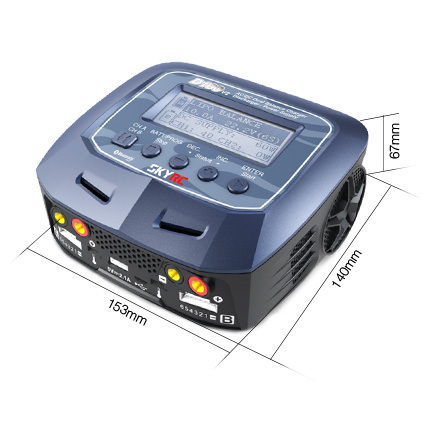 The ability of supplying 100W/13.8V DC power dramatically expands its usage scope, which is really an amazing partner for hobbyists to power the DC equipments. 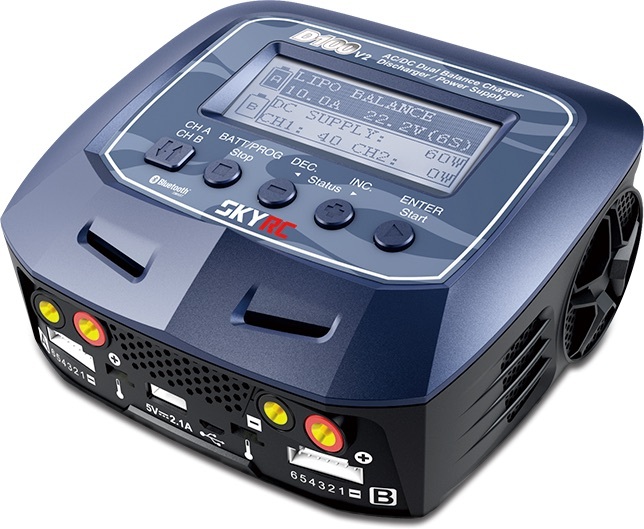 SkyRC D100 v2 allows you to plug 2 batteries into one charger simultaneously, and it will intelligently and automatically charge 2 batteries at once. The Bluetooth 4.0 connectivity allows the user to remote control and monitor the D100 v2 comfortably through an app on a portable device such as smartphone, iPad, or iPhone. The iOS app can be downloaded from iTunes Store, the Android app from Google Play Store. Operation of the app is self-explanatory and the same on iOS and on Android. Explicit pairing is not required; after download and installation just activate Bluetooth on your mobile device and launch the app. D100 v2 and your device will establish Bluetooth connection automatically.